Requires one megabyte of RAM, double-sided disk drive and monochrome monitor. Ian Chadwick is a Toronto–based freelance technical writer, specializing in desktop publishing and word processing. 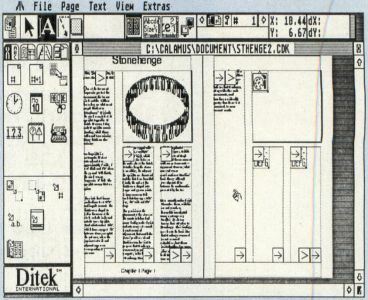 Calamus brings a whole new level ofdesktop publishing to the Atari ST, reaching the professional user, but at a price still affordable by the serious amateur. Compare this to the $895 suggested list price for Ventura Publisher 2.0 (plus $595 for the Professional Extension package), and you'll know what I mean. 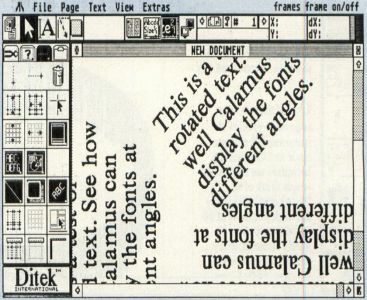 Calamus is a mixture of power and grace, providing a wealth of features that rival and often surpass the professional-level PC desktop publishing packages—with oddities and awkwardness. Unfortunately, Calamus contains flaws, many of which are minor and appear to be simple oversights, the programmers aiming at the big picture have failed to make sure that all of the small elements were taken care of. Many problems arise from the program's design and user interface. The sheer number of features and functions in this program, coupled with the enhanced user interface, make Calamus far more demanding and difficult to use than either Publishing Partner or Timeworks' Desktop Publisher. On the plus side, the control over the output and the ability to manipulate the page contents and the display is correspondingly higher. But be prepared to spend frustrating hours pouring over the manual looking for explanations and hints as to how features actually perform. Without an index to guide you, this is an unrewarding task and—even when a reference is found—the result may be disappointing or unexpected. The manual is far too unrevealing, forcing the user to experiment constantly to discover the limits of almost every command. For example, there is an icon titled "header/footer frame." By this, one assumes you can create both types of frames: headers and footers (referred to as "headlines" and "footlines" in the manual). This is not contradicted in the manual. But when you try to create both types, you discover you can have only "one header/footer frame on a page," as the error message warns you. Some experimentation shows that several frames can be joined into a single header/footer group. Some features prove better than you expect. The display is truly WYSIWYG—something Ventura lacks. Calamus displays all fonts in crisp clarity at all sizes. This is due to the use of vector (not raster) fonts. No matter what size a font is magnified or reduced to, it remains highly visible. Calamus can also display fonts in rotated text boxes in any angle, even upside down! While Calamus comes with only two font families (a serif and a sans serif in several sizes and italic faces), ISD signed a deal with Compugraphic to sell 96 of its fonts to registered users. Since Calamus can talk directly to a Linotype machine (a raster image processor, RIP, is under development and should be for sale soon), this really moves Calamus into the professional DTP league. 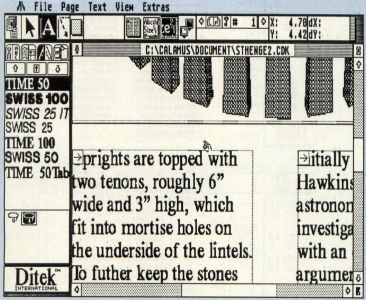 For those of us with more modest needs, a vector font editor package is due for release in the first quarter of 1989. One of the nightmares a layout designer must work with is the shifting nature of available space in a commercial publication. Articles, if not edited to fit the space, often have to jump great gaps of pages to continue. Calamus handles this with ease, even permitting jumps to previous pages, not merely those following. It also supports automatic text flow from one page to another. More than a simple layout program, Calamus includes a host of graphic design elements such as raster frames in a wide variety of shades, backgrounds, shadowing and shapes, half-tone picture sizing, optimum picture size for screen and printer, cut pictures that show any portion of the image, numerous grid, margin and help-line functions, rulers, a five-part clipboard that accepts entire frames, text and even graphics, 15 line types in background pattern, shade, end or thickness and more. Calamus automatically handles kerning in all fonts and at all sizes. There are additional controls to move characters and adjust word, character and line spacing. 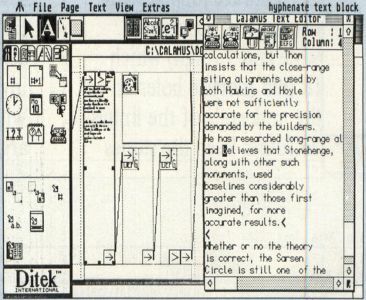 In text manipulation and control, Calamus only provides lukewarm support. The text editor is so embarrassingly primitive as to be barely deserving of the name "editor." It should be ignored except where absolutely unavoidable. The only redeeming characteristic it provides is that text appears formatted in the same width as the frame it represents. The "index" function is misleading and worthless: It can neither sort entries alphabetically nor provide page numbers, see or see-also references for the entries! It merely copies or moves highlighted text to a specific frame, in the order it finds them in the original frame. On the plus side, you can control such elements as page and chapter numbering, hyphenate text, insert footnotes and control text style, size and display type to an amazing degree. You can import or export text as ASCII, Calamus, MS-Write and 1st Word formats, but not WordPerfect or ST Writer. Raster graphics files can come in as DEGAS (files and blocks), Calamus, GEM Image (.IMG), GFA BASIC blocks, IFF and STAD (a popular German file format). Raster graphic files are .GEM metafile or Calamus file format. Lined up against a program like Ventura, measuring feature against feature, Calamus can comfortably hold its own. Some of the features may strike you as less than satisfactory however. For example, although Calamus can directly control scanners, two of those supported are not sold in North America (the Silver Reed and the Hawk CP-14) and the third (Panasonic FX-RS505), while available, has no ST interface. None of the best-selling scanners on this continent are supported. ISD accepts the scanner interface on faith, since they have only been able to test the Silver Reed—which wouldn't work with either Calamus or its own ST scanning software! Other features fare somewhat better. Virtual copy is a godsend for designers who need to create and work in multiple-copy works such as business card templates. It essentially reflects any change to the original or any virtual copy to every other virtual copy. There is a macro feature in which text rulers, text style and text itself can be saved as a control-key macro and used in a similar manner to Ventura's paragraph tags, to apply a style to a body of selected text quickly and easily. Unfortunately, the programmers neglected to include the simple shift-click means of highlighting a block of text as in many GEM applications. The designers of Calamus made a special effort to overcome the restrictions created by the inept design of the Atari SLM804 laser printer. The printer was built without any memory or the possibility of adding any—a marketing device, no doubt, to push Mega ST sales. Laser printers require at least one megabyte of RAM to process a graphics page, and because of the printer's poor design, owners of 1040 STs are unable to use it except as an overpriced text-only printer. Not so with Calamus. On a 1040 ST, you direct the output to disk. Then you shut off the machine and reboot, without any desk accessories or other programs loaded, with only a small program called DISK__PRT in an auto folder. This program takes the output files and uses all of the available memory in your 1040 to process the print for the SLM804. Not a very elegant method, but certainly DMC should be applauded for coming up with a solution. Printer drivers provide adequate, if not extensive, support for 8- 9- and 14-pin dot-matrix printers, as well as the HP LaserJet Plus, the most commonly used laser printer in the U.S. However, there is an enormous range of printers not supported—the enormously popular Epson LQ series for example—and one can only hope that the programmers will provide drivers for them in the very near future. There is a large hyphenation dictionary for text, but ISD was unable to name the source. The hyphenation appears adequate, but without knowing what authority created the word breaks, I'll only use it with a known dictionary (Merriam Webster's, Random House, or Oxford University Press) beside me. Working with Calamus can prove to be initially bewildering. It uses an icon-based interface, along with the standard GEM menus (and many enhanced-GEM dialog and file selector boxes). 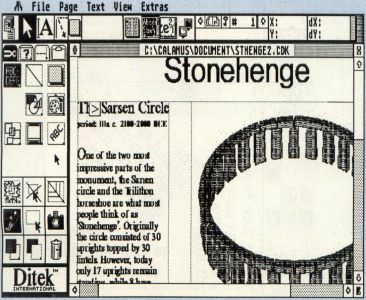 Many icons lead to one or more levels of additional icon pads. At the top of the screen, a brief description of the purpose of an icon appears, so you don't need to memorize them all. These messages, by the way, can be changed by any user by editing the text files provided. After a few hours, the interface becomes second nature and proves quite easy to use, although Calamus is overly mouse-dependant and lacks keyboard alternatives for many of its functions. You can apply some of the commands to the function keys by editing the various ASCII help and message files in the system, but it seems that this forces the user to do what the programmer should have done originally. Frames can be set to exact X,Y coordinates, which makes layout more precise. Text frames can be set to flow around other frames (text or graphic) for text runaround on either side of the frame. If you move a frame from a runaround, the runaround area remains intact until you re-select other frames for runaround. This permits you to then offset the first frame to create white space between frames. Frames can be inserted into or cut from a piping chain. It's easy to simply list the features, but that doesn't give the reader the true picture of either what Calamus can do or what its weaknesses are. You have to work with it to fully appreciate the richness inside. It's hard not to compare Calamus with Ventura, but overall, I'd say it provides a better working environment than the latter. Certainly the display capabilities are far superior. If the weaknesses can be overcome, Calamus could become the most popular DTP program around, on any computer system. Calamus is not without its flaws and bugs. It crashed on several occasions while I wrote this review, although I was not always able to duplicate these problems in subsequent tests on a slightly later version. The flaws are another thing. DMC put an enormous effort into the development of the main features, but appears to have glossed over many small, user interface issues. Many dialog boxes, for example, are missing a simple "cancel" or "abandon" button. They also made several design choices which run counter to the standards set in the more advanced PC DTP market. Undo should reverse the last action taken. As far as I can figure, Undo has no inherent function in Calamus. Without a working undo, it's far too easy to make fatal mistakes, such as accidentally deleting the wrong column, after spending hours formatting and editing. The Delete key should delete a selected frame. It, like Undo and Help, has no function except in the text editor. There is no "greeking"—using symbols to simulate text and speed up the display process. Even at unreadable sizes, Calamus attempts to properly display text as characters. This is unnecessary. You can, at least, turn off the display of any type of frame and just leave the frame boundaries on screen. Calamus continues the curious and annoying practice in the ST world of forcing the user to create each frame for multi-column text individually, rather than being able to designate a single text frame as multi-column as you can in Ventura. One must then create "piping" channels to direct text flow. While not overly difficult, it is certainly cumbersome and primitive compared to Ventura's elegant process. 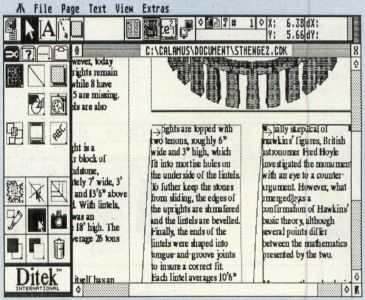 It also prevents the user from selecting text across multiple pages or frames. There is no way to anchor graphic frames to particular text, although you can group frames together. There are no automatically generated caption frames for graphics. They must be manually created, as individual frames, then grouped with the graphic. Frames can't be printed. You have to create a raster frame around the existing one, another minor but time-consuming annoyance. The "index" function is nothing of the sort, and the results produced are so unsatisfactory that DMC and ISD should issue abject apologies for misleading users as to what they're getting. The manual lacks an index, which makes trying to find anything in the book simply horrendous. This is an inexcusable lack in any program that has even minimal pretenses to professional use, let alone something of the calibre of Calamus. The manual is graphically well produced: It was done in Calamus itself and shows its capabilities, but neither the index feature nor the hyphenation dictionary were used, a telling comment on these functions. The manual is sometimes helpful—in the discussion of fonts, and raster versus vector graphics, for example—but in most other areas it fails to provide the necessary information in sufficient depth. It lacks a tutorial, glossary, technical appendices on file formats, error message explanations, and the descriptions and explanations are often simply not detailed enough for the user to understand without patient experimentation. There is no online help system to supplement the manual. Indeed, the Help key performs no function at all in Calamus. Finally, the grammar is often bad (owing, I suspect, to a faulty translation from the German), and there are typos and spelling mistakes in the book. I was able to spend several hours with Nathan Potechin of ISD, going over the program, which considerably heightened my respect for Calamus. Most users are not afforded this luxury and must depend on the inadequate manual for their training. ISD is well-advised to scrap the current documentation and rewrite everything from scratch. Faults notwithstanding, Calamus is an amazing program, and the features and functions outweigh the problems. Development is ongoing and changes are being made to the code by DMC in Germany. Unfortunately, we in North America don't benefit immediately from its efforts. It is also working on a Calamus Plus package, with an improved text editor, vector and raster graphics/paint packages, proper indexing, and more. It's unfortunate that ISD/Ditek chose to enclose Calamus in a plain white box without some sort of explanation on the wrapper of the features and functions supported by the program inside. The buyer simply will not be able to fathom the power of the program from the box. That's a poor marketing decision; Calamus's light is too bright to be hidden under a bushel!